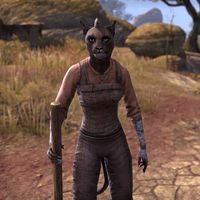 Heleni is a Khajiit commoner who can be found in S'ren-ja. She believes that missing people from S'ren-ja have been eaten by the crocodiles from the waters surrounding the town. This page was last modified on 29 April 2017, at 21:55.